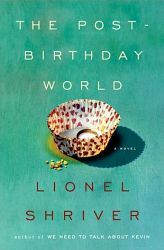 I decided to read THE POST-BIRTHDAY WORLD by Lionel Shriver because I loved its concept and because I loved her novel WE NEED TO TALK ABOUT KEVIN. In THE POST-BIRTHDAY WORLD, Irina is faced with a decision: to kiss Ramsey Acton, or not. Shriver examines both options, setting out Irina's destinies in both instances, in parallel. In the world where she kisses Ramsey, Irina leaves her long-time not-quite husband Lawrence and starts a new life with Ramsey, a passionate snooker player. In the other storyline, Irina does not kiss Ramsey, and chooses contentment with Lawrence, a reliable and thus predictable man. It is an in-depth look at that pesky "what if?" question we pose to ourselves when we do, or don't. It's not so much which is better as it is a look at two imperfect options, both of their ups and downs. Because that's life, and that's the difficulty of a dilemma. The text is also too dense, and that was my main problem with the book. Ten pages of THE POST-BIRTHDAY WORLD, and I had my fill for the week. While I appreciate the care Shriver takes in developing Irina's character and situation(s), I had enough of Irina's (double!) depressing introspection after 100 pages. The more pages I read, the more I felt inclined to shove a DVD of Sliding Doors in my DVD-player and watch that brilliant parallel-worlds story, instead. Shriver knows a lot and writes a lot, too. One of many examples is a moment where Irina's fingers stiffen up from the cold due to Reynaud's disease; Shriver feels the condition is worth a plug and an explanation at some point in the narrative. Why does Shriver spend so much time on these kinds of details? It's almost self-indulgent: "Behold my (random) knowledge!" Here comes the line us reviewers love to throw around: "Where was the editor?!" But I feel my complaint is valid here; as much as I admire Shriver's writing and her intelligence, this book is simply too "full", unnecessarily. THE POST-BIRTHDAY WORLD, although very insightful and raw in a sense, is a real chore to get through. It bored me, times twice – and when it didn't bore me, it depressed me. The text was not only dense, it was also intense. I felt relieved when put I it down; I dreaded having to pick it up again. I'm not one to shy away from non-perky books which handle heavy subject material; but I don't wish to be depressed AND bored on top of it. Had I perhaps cared about the characters…but I didn't. I tried liking Irina, but I just didn't find her sympathetic at all. Lawrence was dull. But the worst has to be Ramsey: overkill, embodied. His British was laid on too thick and it was inconsistent (multiple dialects blended together). Shriver had him blurting out lines by the likes of, "If I was a bird, I'd be fancied a right mug. (…) But I'm a bloke, so instead I'm Jack the Lad. Hand in the knickers, and it costing me no more than the odd chardonnay." The rain in Spain stays mainly in the plain, my dear fellow. I didn't believe him as a character and what's more, I couldn't see Irina falling for him. Ramsey didn't work for me. And so the entire book, which hinges on Ramsey and that one kiss, also didn't work for me. I think most people who read a lot of books can name (at least) one book that continues to haunt them. The book that still chills you to the bone a long time after you've read it. Lionel Shriver's WE NEED TO TALK ABOUT KEVIN is one of the best books I have read in my life. But it is also the one that stays with me, a hovering ghost, a poltergeist in my rattling book case. During my studies in psychology, that one question always popped up, whether we (in class) were discussing neuroscience, child rearing or the prevalence of depression in heart patients. The Never Ending Nature-Nurture Debate. Are we shaped by our genes, our experiences, or both? Lionel Shriver's book asks: is it possible for a child to be born evil? Or do we, Freudianly, simply point our collective finger at its mother? Eva Khatchadourian is not the most open or nurturing woman in the world. Ask anyone in her immediate area: Kevin's mother couldn't possibly be anything but cold and incapable of affection. It's almost not surprising, then, that her son would take his bow and arrows, and use them to kill his teacher, a cafeteria employee and several of his classmates. In a series of letters to her estranged husband Franklin, written since Kevin's incarceration, Eva reminisces about her life before Kevin, and life up until the mass-murder, trying perhaps to answer the question for herself – could her distance towards Kevin be the reason why he's a sociopath? Should she feel guilty? Or is it the other way around – did Eva's clear lack of affection for her son result from her instinctual knowledge that Kevin is not inherently good? Lionel Shriver's got some guts. A high school shooting is very sensitive subject material, and to combine that with what invariably happens in real life (blaming the parents, specifically the mother) is pretty daring. We need to blame someone, and blaming the child – the shooter – isn't enough. 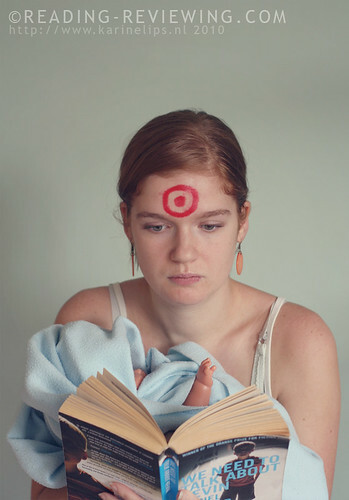 We really like the nurturing aspect of the nature-nurture debate when it comes to violence. Children, we think, are still born innocent. Just blame the mother when it turns out differently. Normally, we'd rather not interfere with someone else's parenting, child rearing. Yet we're so quick to judge these parents when something goes terribly wrong. It's easy to say that Shriver "must really have it out for kids" (and parenting) by writing this book; she has no children of her own. It's easy to say a mean-spirited Shriver sensationalizes a subject – using a child – in order to keep us, curious readers, turning pages. Kevins – young sociopaths – do exist in the world. Usually though, their sociopath behaviour doesn't fully express itself – or: evolve – until they are older. They become the Mansons and Unabombers of our time. While it's important to note that sociopath behaviour would usually manifest in a lesser degree, mass-murderers can come from a loving home (example: serial killer Robert Yates). One cannot say that sociopathy is caused by bad parenting. Reverse it: there are plenty of kids from broken homes, with abusive and neglectful parents, who grow up to be non-violent, productive members of society. Correlation does not causality make. Shriver takes the above, and puts it out there more bluntly: a child could be evil by nature. Emphasis on could – she never tells the reader what to think. I'm not a parent, but I hope to be a mother one day. But I'm not going to stick my head in the sand. There are faults with WE NEED TO TALK ABOUT KEVIN, an example being Franklin's excruciating naivité regarding his son, but I generally do see the merit in Shriver's story. A born sociopath, manipulative from a young age, his mother powerless. It's extreme, but these extreme cases do happen. In Shriver's case, Kevin does not come from a very loving home. Eva is flawed: arrogant, distanced and selfish, never really wanting any children. She's not a pleasant person, off-putting even (please don't let it stop you from reading this book). Family has never been her priority. She makes many mistakes. By having Eva be as she is (instead of being a clear, loving mother), Shriver leaves it up to us to figure out whether the chicken or the egg came first, but she makes sure the reader has a powerful debate with themselves. Because we only see things from Eva's point of view, it does mean her narration is unreliable; she could still be making excuses to the man she loves, telling everything from only her side. She could be exaggerating. She could have selective memory. But it's clear she's feeling guilty, having lost everything and trying to make sense of it all – and she craves forgiveness from her husband. She's desperate. We realize that throughout it all, Eva is human, afraid and horribly alone – the only one who realized something wasn't right with her son before he, aged 15, took his weapon of choice to school one day, and used it. She was, ultimately, powerless. The epistolary style works; it keeps the reader asking questions – and thus involved, interested. It also allows us to really get to know Eva intimately, and it makes for an interesting character study. Being put in Eva's shoes is an experience, to say the least. This book is very tough. It's frightening, and cruel. Shriver's psychological insights are her strength – she knows her characters, and (I sense) she also knows her readers and how most of them will react to Eva and Kevin. It's an astonishing effect. This is a dark book, and when you finish it, you feel something far from closure. I still get goosebumps when I think about the final chapters (it's that poltergeist). KEVIN is not a factual case study, but a work of fiction. But for a few people in the world, this fictional nightmare is, in some way, a reality. I personally do think a reader should be ready to accept that in order to understand this book. Otherwise, you'll find fault after fault with it. This is a book you need to be ready for.